In the Republican presidential debate, Carly Fiorina said women aren't a special interest group. That's not true. 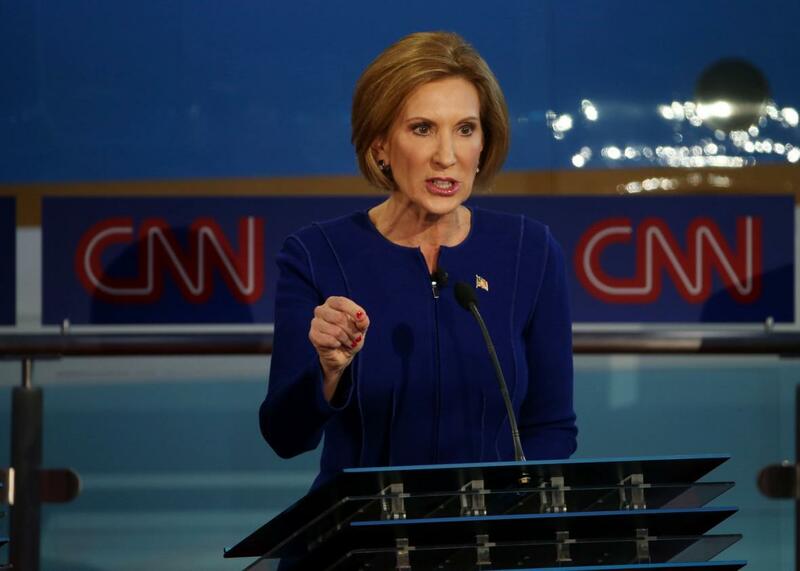 Carly Fiorina may have proved her worth as a running mate in Wednesday night’s debate. Thursday’s consensus has declared Carly Fiorina the winner of Wednesday night’s Republican debate. She was poised and well-prepped, she threatened front-runner Donald Trump’s claim to the top spot with well-corroborated criticism of his corporate leadership record, and she offered a sharp response to his earlier insult of her appearance. I wouldn’t change the $10 bill or $20 bill. It is a gesture. I don’t think it helps to change our history. What I would think is—we ought to recognize that women are not a special interest group. Women are the majority of this nation. We are half the potential of this nation, and this nation will be better off when every woman has the opportunity to live the life she chooses. In a debate whose only brush with gender issues was a skirmish about who wants to defund Planned Parenthood the most—including a particularly dubious riff from Fiorina herself—it was a relief to hear someone call out the question out as a meaningless softball (albeit a softball that all the men still whiffed). But as long as women are getting paid and promoted less than men, working mothers denied proper leave and child care, and women’s bodies and clothing policed by authorities, women will remain a special interest group. Any potential U.S. president should have to answer to specific questions about the state of gender inequity in our country and how he or she would better it in office. It’s easy, at least in theory, to identify Parks or Susan B. Anthony as unobjectionable historical figures. It’s harder to address the diverse everyday experiences of women today. Throughout the evening, Fiorina proved herself to be the most prepared of the candidates, laying out logical answers with eloquence and strength. Unlike the most recent women we’ve seen on the debate circuit, Michele Bachmann and Sarah Palin, Fiorina is too on top of her game to be dismissed as “crazy,” dim, or insubordinate by GOP brass. As both the only woman in the debate and the one with the best answers, Fiorina positioned herself as a solid running mate for a nominee going up against Hillary Clinton. Those concerned about the prospects of a country led by any of the men onstage Wednesday night should pay her close mind.